The Sholk Road Adventures: Happy New Year! This is perhaps the longest time I have gone without updating the blog while overseas. My sincerest apologies. The delay is in part due to the demanding nature of field work, exhaustion from research and sensitivity to my research subjects and environment. I shall briefly recap the past few months. At the end of October, I began working at Baraholka, the international hub bazaar in the outskirts of Almaty. 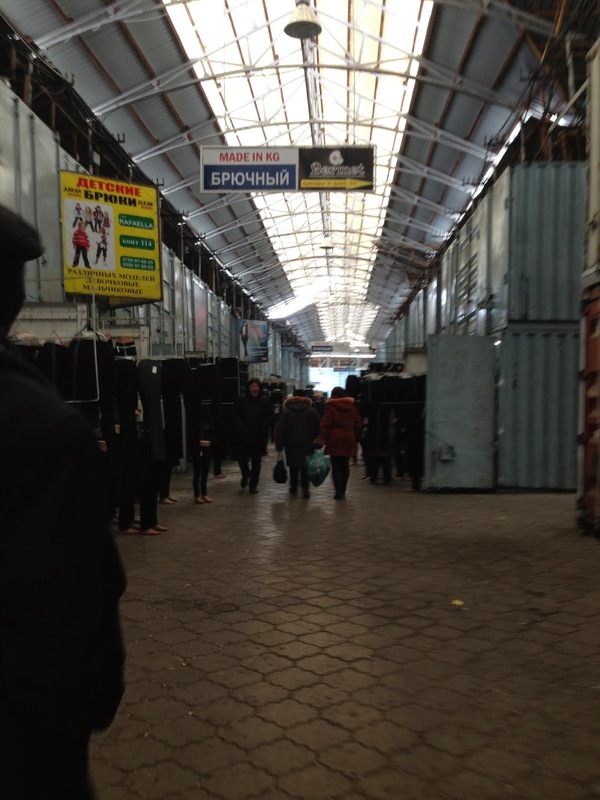 "Baraholka" -- which directly translates from Russian to English as "flee market"-- refers to a general area that includes over 17 independently-owned and operated markets. I knew I wanted to work at Baraholka and really immerse myself in the environment in order to understand the contemporary state of the bazaar trade, experience the daily grind of employment in a bazaar, and gain insights into the bazaar business model. 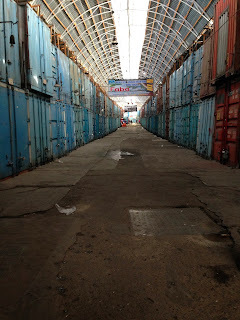 A friend of mine is a Professor at a local university and his neighbor owns three containers in one of the markets within Baraholka. He was kind enough to introduce me to his neighbor, and I have since worked there between two to five days per week. My boss is a very sharp ethnic-Kyrgyz in his early 30's, while my other coworkers are a local Russian and a Tajik, both in their 20s. Our lingo franca is Russian. Many of the traders in our market are primarily from Tajikistan, but include Kyrgyz and Kazakhs. Many of the Tajiks are young men who fit the definition of "migrant workers" and "senders of remittances." They work in the bazaar for ten months out of the year (many go home in January to mid-February, during the off trading season) and send remittances home to their families on a weekly or monthly basis. Some stay for years at a time. When I first started working there, they thought I was a Turkish or Azerbaijani girl, and then they were astonished to find out I was American. But we have since become friendly coworkers as I have spent hours in the bazaar, chatting with them on slow trading days. On the one hand, there are clear cultural differences and norms on gender, marriage, etc. One guy told me he has two wives at home in Tajikistan and is looking for a third local wife. Nearly all tell me how they can cook the most delicious plov (a traditional Tajik dish). But there are also many educated people in Baraholka. I've met at least twenty people in my age cohort who graduated from university and now work in the market as the earning potential is higher in Baraholka than in many positions in the formal economy. Overall, traders are very smart people who engage in honest work -- they are in the market from 10 am to 7 pm (sometimes earlier, sometimes later), trading goods in the freezing cold. This is clean, honest work. I am not a "humanitarian, do-gooder" person, per say, but I emphasize that the honest and quality nature of the people to counter the perception that people in Baraholka are uneducated and small-minded. Many of them are willing and open to learn. It is in the strategic interest of the regional government to incorporate the traders in Baraholka into any development strategy that promotes entrepreneurship -- they are a valuable part of the workforce. On a daily basis, I deal with customers, asking for their size, fitting them, etc. I run between the containers to get the shoe sizes and mates. In addition to the insights I've gained into the local economy and socio-cultural perceptions of workers in Baraholka, working with customers as a salesperson has been a very humbling, interesting and thought-provoking experience. Most people come and go not knowing I am an American -- let alone a Georgetown graduate and Masters student and Fulbright scholar -- they all think I am some dumb girl who is working in Baraholka to make ends meet. People can be so rude. Conversely, some people are very gracious and kind. Clients and other traders are always surprised to find out I am an American sine I dress and act like the locals. One client commented in early November, not too long after the shutdown, "I knew America was having economic problems, but I had no idea Americans were coming to Baraholka to find work." This is pretty funny, because many people began to trade goods at Baraholka as a coping mechanism after the fall of the Soviet Union. In addition to my fieldwork in Baraholka, I interview businessmen in order to gain a better understanding of the micro and macro-level trends in the small business environment. I try to attend some conferences here and there, but I find the interpersonal interactions are the most valuable. I also host an English club on Thursdays at a local NGO. This has been a fun way to interact with local students and even pensioners. We just chat for 75 minutes on anything from academic integrity to travels. Finally, I took Kazakh classes twice a week last semester. I must admit that I was not the student I wanted to be in that I did not give the language nearly as much time as it deserved, and I mostly rely on my Russian. My Kazakh is limited to "Baraholka Kazakh" which includes phrases such as "what size?" "how much" and numbers. But my New Years Resolution is to be a better Kazakh student, so we will see how that goes! As for travels outside of Almaty, I went to Khorgos in October, celebrated New Years in Astana and spent some time in Bishkek, Kyrgyzstan. Bishkek was fabulous! It was my first time in Kyrgyzstan and it is very similar, yet quite different to Almaty. Interestingly, I flew from Astana to Bishkek and the difference between "new, wealthy Kazakh capital" and "aging, Soviet Kyrgyz capital" is vivid, to say the least. I went to Dordoi bazaar in Kyrgyzstan, the largest wholesale market in Central Asia. I was very impressed with Dordoi, as there is one section of the market that is reserved for domestic producers -- only goods that are made in Kyrgyzstan can be sold there. Few people know, but Kyrgyzstan has a thriving domestic manufacturing industry. It is small when compared globally, but for the country, these small-scale companies are important. I interviewed an entrepreneur who started his own women's pants company in 2011, employs 10-15 people and now has yearly profits of $25,000. Yes, this is a small figure, but for a country with around 6 million people and an average yearly salary between $600 and $2200 (according to IMF), these small-scale producers constitute a burgeoning entrepreneurial class. According to Kyrgyz law, all items shipped from Kyrgyzstan that are domestically produced are duty free. Many producers purchase fabric imported from China, make garments domestically, and sell them to wholesalers in Dordoi. While this is a simple model, it makes a lot of sense. While the central government in Bishkek does not have the resources to actively support or subsidize industry, by instituting an effective trade regime with China (props to Akaev), and creating a legal environment in which entrepreneurs can start small scale businesses and bring them to market in an already popular and proven institution -- Dordoi bazaar -- Kyrgyzstan now hosts a domestic, and competitive domestic manufacturing industry. A picture of the Central Square in Bishkek. The main entrance to "Dordoi Bazaar"
Obligatory Soviet-era monument to the Great Patriotic War in Bishkek. Unfortunately, the Lenin monument has long since been removed. 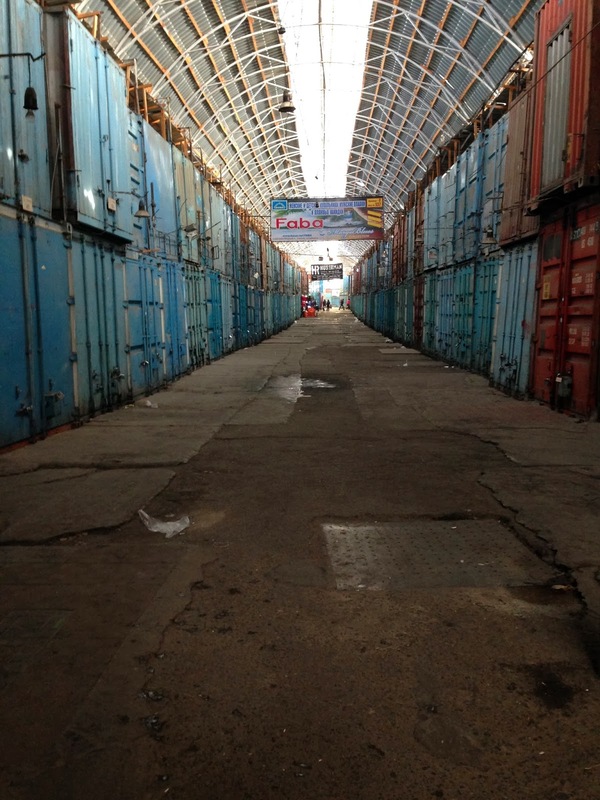 A row of empty containers in Dordoi. The "Made in Kyrgyzstan" section of Dordoi. In the near future, during the off season in the bazaar, I plan to do some travels to Northern Kazakhstan -- so stay tuned! !